Summer is here and everyone is concerned about their bodies in swimsuits, shorts and tank tops. If you want to shed a few pounds to feel better and control your blood sugars you’re not alone. Consider a few simple techniques to get the weight off for summer with diabetes. Fad diets rarely work and the weight loss is mostly temporary. Most fad diets involve erratic eating habits that can wreak havoc with your blood sugar levels and cause additional health problems. Stay away from diets and adopt healthy eating and lifestyle habits instead. There is no substitute for well-balanced meals, healthy snacks and daily walking. Summer is a carefree season when people tend to grab food on-the-go. Avoid the temptation of ice cream and yogurt shops along with fast-food restaurants. If you do visit these places make wise choices; include grilled chicken, salads with light dressing, baked potatoes with vegetables and whole grain buns . Choose small portions of diabetic candy to reduce the temptation of eating fatty, sugary foods that lead to weight gain and blood sugar fluctuations. Losing weight involves some common sense. If you eat more calories than you burn, you will gain weight. Keep track of your calories and exercise habits by writing them down in a journal, using a Smartphone app or wearing a fitness device. Balance is critical when you want to lose weight. Make sure to spread your calories throughout the day rather than eating most of your calories in one large meal. This is bad for your weight but especially troublesome for your blood sugars. Healthy weight loss involves lifestyle changes rather than a quick fix. It involves more than changing your eating habits. Just move. Go swimming, take a hike or walk the dog. Engage in summer sports, such as rowing and volleyball. Stretch and stand while doing desk work or watching TV. Get support from your family and friends or join a weight loss group to get encouragement. Talk to your health care provider about proper eating and fitness. Consider working with a dietitian, diabetes nurse educator and/or exercise trainer to help you achieve your goals. Try to lose one to two pounds a week. Losing too much weight at once can ultimately result in failure. When you shed pounds quickly you are usually losing water, which can lead to dehydration and other health issues in the summer. You should stay hydrated with plain water and add a slice of lemon or lime for flavor. Eliminate energy drinks, regular soda, sweetened milk beverages and other sugary refreshments that contain empty calories. Include all food groups in your daily diet. Look for healthy fat choices such as salmon, avocado and olive oil to include in your diet. Eat whole grains, beans, starchy vegetables, low fat milk and yogurt and fruits to add carbohydrates to your meal plan. Be aware of your eating habits. Emotional eating occurs when you are tired, stressed or fatigued. Mindless eating usually happens when you are running around all day or sitting down to watch television. Know what you are putting in your mouth and only eat when it is time for a meal or snack. Try not to skip meals or snacks, which can cause blood sugar highs and lows and lead to binge eating when you feel hungry. Skipping meals can also lead to weight gain. Always discuss food and fitness plans with your health care team before you start any new routine. Have a goal in mind. Losing just 5 percent of your overall body weight can make a big difference when it comes to good health. When you want to feel better and control blood sugars work toward your goal and visualize the results. These basic techniques to shed pounds for the summertime can also help you develop healthier lifestyle habits. 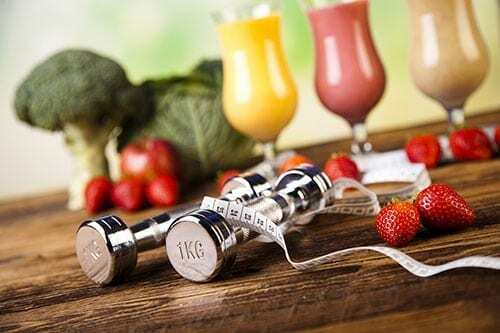 Eating properly, exercising regularly and sleeping for at least seven-eight hours each night can help you maintain a healthy weight without feeling deprived. Take care of yourself and you’ll be sure to feel great all summer long.